EMEC / MYANMAR HEAVY INDUSTRIES EMERK-3 rifle and MA-1 carbine. Burma (official name: Myanmar) is a south-east asian country ruled by an extreme right-wing dictatorship, held by a fascist military council. Human rights are infringed day by day, oppositors are imprisoned and simply disappear from the face of the earth, public protest demonstrations, even when pacifical, are usually suppressed with the use of lethal force. This has made Burma the object of an UN armaments embargo, furthermore Burma is one of the countries blacklisted by the US Department of State and Department of Commerce, this meaning that NO american company can sell ANYTHING to Burma. Unfortnately, according to the NGO "Free Burma Coalition" and to the authoritative JANE'S DEFENCE publishment, Burma has founded an its own arms industry. EMEC (The Electro Mechanical and Engineering Corps of the Burmese Armed Forces) are in charge to engineer new weapons. The KA-PA-SA state-owned armaments factory located in Rangoon has acquired from a now defunct italian firearms manufacturer, in 1945, the right to manufacture the TZ45 submachinegun, there known as the BA52. Long before the arms embargo struck Burma, a german engineer, called FRITZ WERNER, established there plants to manufacture G3 battle rifles; after the embargo, the factory was taken over by the military government, who renamed it MYANMAR FRITZ WERNER COMPANY (despite of their names, however, ALL the burmese arms factories are state-owned), where G3 rifles are still produced, and from where come out also G3 rifles converted under project of EMEC to feed from STANAG M16-style magazines and fire the .5'56x45mm-NATO ammunition. It's however known that EMEC has HOWEVER its own production plants, known as MYANMAR HEAVY INDUSTRIES ORGANIZATION. It's also known that countries such as Israel and Singapore often sell illegally firearms manufacturing technology to this country. A major scandal happened when it was known that a controversial oil duct built in Burma was patrolled by guards armed with a new bull-pup rifle, called EMERK-1 and manufactured by EMEC - MYANMAR HEAVY INDUSTRIES ORGANIZATION. Before this, a chinese company called NG CHUNG-KEUNG, subsidiary of NORINCO, had shipped to Burma under burmese governmental request some exemplars of the new NORINCO QBZ-97 .5'56mm bull-pup assault rifle for evaluation. 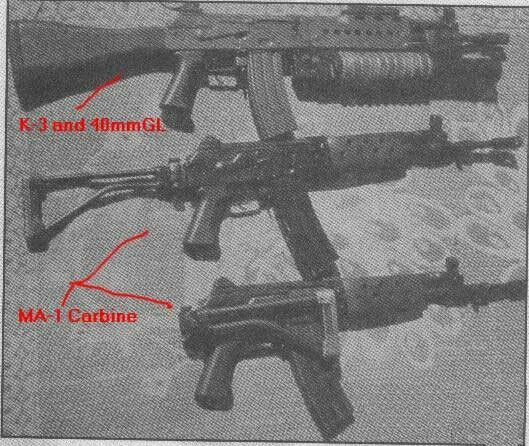 The burmese trialers were positively impressed by this weapon, but the communist chinese government didn't really wanted to sell firearms to an extreme right-wing dictatorship, and thus the shipment of the new QBZ-97 rifles to Burma were halted and further ones completely canceled. So the burmese engineers took over the exemplars of QBZ-97 still illegally remaining on the country, and modified the project of the weapon to allow it to be manufactured with some minor modifications with the machineries they had, illegally sold to Burma by Singapore. It's also known that the EMERK-1 is slightly similar to the Steyr AUG, and that israeli IMI engineers who previously had worked to the IMI TAVOR project traveled to Burma to counsel their burmese colleagues; little is known about this EMERK-1 bull-pup rifle, except that it is in the hands of "élite" burmese troops, it's a "melange" of the chinese NORINCO QBZ-97, the singaporean ST-KINETICS SAR-21, the austrian STEYR AUG and the israeli IMI TAVOR, that it's manufactured in both AR and SAW variants and that the burmese troops that have it, especially governmental guards, don't like it because it's prone to jammings and stoppages. Instead, the MAIN weapons system of the Burmese Armed Forces is well-liked by its users. The EMERK-3 Rifle System, as posted in this pic smuggled from Burma, is an illegal copy / updated version of the israeli IMI GALIL assault rifle, manufactured under supervision of israeli consultants and with the use of israeli and singaporean mahineries shipped to Burma in violation of the UN/USA embargo. The EMERK-3 rifle is nothing but a GALIL rifle with fixed stock. In this picture is also equipped with a BA203 40mm grenade launcher, a slightly modified illegally produced version of the american M203 grenade launcher, which makes JANE'S and FREE BURMA COALITION observers think that machineries to manufacture this launcher were also illegally shipped to Burma from USA companies, but most probably the responsible for this new embargo violation is Singapore, which has obtained the license to manufacture the american M203 to equip with it national-manufactured rifles such as the M16-S1 (singaporean copy of the AR15 assault rifle, now out of production), SAR-80 and SR88 weapons systems and the new SAR-21 bull-pup long firearms cache. When mounted on the EMERK-3 rifle, this M203-lookalike grenade launcher features also a new barrel cover for the rifle, equipped with a grenade peepsight. The EMERK-3 RIFLE is appearently identical to the IMI GALIL exception made for some very little external carachteristics, so that the GALIL specifics are assumed to be valid for this rifle too. The MA-1 CARBINE is a shortened copy of the EMERK-3 rifle, with a folding metal buttstock. The barrel is shorter that the one of the EMERK-3 rifle, and the similarities with the GALIL are much more pronunciated. The MA-1 features a ventilated handguard. Both the EMERK-1 bull-pup rifle and the MYANMAR FRITZ WERNER COMPANY / EMEC prototype .5'56mm G3 version feed from STANAG M16-Style magazines, while the EMERK-3 rifle and the MA-1 carbine feed from GALIL-style 30-rounders. Other details about the burmese firearms production are scarce. This picture was ripped off from a website which a few days later disappeared from the web (shutdown by the burmese government, maybe? ), and the burmese authorities by themselves are prone to use ALL ways to keep their domestic weapons production secret.